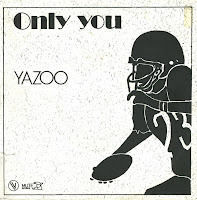 I always regretted the fact that I discovered Yazoo too late to buy their debut single, 'Only you'. After their second single 'Don't go' became a hit, that debut was re-released, but with flipped sides: the B-side 'Situation' reached number 16 in the Dutch Top 40 in November 1982. It took me 28 years to find the original single. 'Only you' reached number 2 in the UK singles chart but flopped in the Netherlands. Despite that fact, the single was impossible to find for all this time. 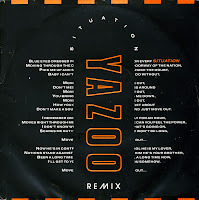 Although I was a really big fan of Yazoo in the early Eighties, I never had the money to buy their 12" singles. And by the time I did, I'd played my singles so often that I just didn't want to buy those 12" singles anymore. On one occasion I did, though: I found a cheap American 12" single of 'Situation' in 1993 and because of its low price I bought it. It's got two versions of 'Situation' on it, that were finally released on cd in 2008 when the box set 'In your room' was released. Well, at least they went out on a high. 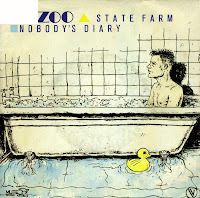 'Nobody's diary' was Yazoo's last single release back in 1983, and it was a piece of synthpop perfected. The single became one of their biggest hits, peaking at number 3 in the UK singles chart. After this, Yazoo broke up. Vince Clarke ended up, after a few short-lived projects, forming Erasure with Andy Bell, while Alison Moyet enjoyed a successful solo career. Last year they reformed for a reunion tour, and on that occasion, 'Nobody's diary' was remixed and releases as a download single. 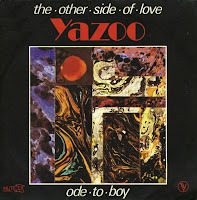 Yazoo released their second album 'You and me both' in 1982, and 'The other side of love' was the first single taken from that album. It was an uptempo song with a strong synth hook. Alison Moyet's soulful vocals completed the package. While the album reached the top of the UK albums chart, the single stalled just outside the top 10, peaking at number 13. It's an energetic sort of song that has stood the test of time. 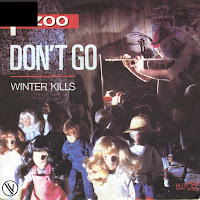 'Don't go' was the second single taken from Yazoo's debut album 'Upstairs at Eric's'. Alison Moyet and Vince Clarke achieved their breakthrough with this single, which became an instant Eighties classic after its release. The single peaked at number 3 in the UK singles chart and reached number 2 in the Dutch Top 40. Alison Moyet and Vince Clarke formed Yazoo in 1981, after Clarke had left Depeche Mode. They took the name of the band from the labels of old blues albums: Yazoo Records. While their debut single 'Only you' was successful in the UK, peaking at number 2, it flopped in most European countries. It was only after the hit success of their next single 'Don't go' that Mute Records decided to re-release the debut single. This time around, the B-side 'Situation' was promoted as the lead track, and it became a hit, peaking at number 16 in the Dutch Top 40. My copy of the single has a new sleeve, but the single is still 'old', featuring 'Only you' as the A-side. It's not a mixup: this is how they were sold in 1982. 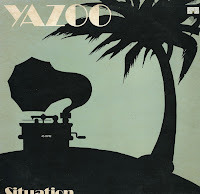 Yazoo has always fascinated the eighties techno generation. Vince Clarke and Alison Moyet only recorded two albums together in the early eighties before going their separate ways. Since then, there have been many compilation albums. Sometimes these compilations were promoted with remixed singles, such as this one. The 1990 'Deadline mix' is an uncredited remix which tries to update the sound to 1990. Remixes are always interesting to me when I like a song enough. In this case, my verdict is undecided.